Strict value investors focus on company fundamentals and price vs intrinsic value and pay little, or no, attention to macro economic data and developments. Though focusing on fundamentals, and buying at an attractive price, is of the greatest importance, even great value stocks will fall during larger stock market corrections (though perhaps by less). Keeping an eye on where we are in the financial cycle driven by central bank policy and fractional reserve banking is therefore also of great importance in my opinion. 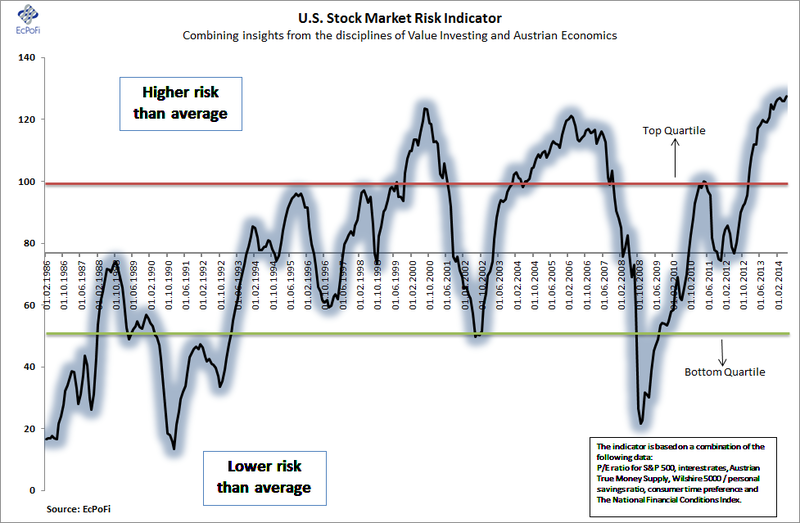 As I consider myself a value investor and as I am a student of Austrian Business Cycle Theory, I thought it made sense to develop a stock market risk indicator that incorporates important elements from both disciplines. Though this is a work in progress, the below indicator incorporates broad stock market valuation data in addition to money supply developments, personal savings, consumer time preference and the financial conditions index developed by the Chicago Fed. Currently, value investing data has a weighting of about 55% with broader economic data making up the rest (though Austrians are no fans of aggregates). A higher reading indicates a higher risk than average that the stock market will deliver poor future returns and vice versa. Currently this risk indicator is at its highest ever based on monthly data going back to 1986, higher than both the 2000 and 2007 peaks. This does not mean however that it cannot claim any higher. Nor does it mean it’s a suitable tool for market timing. In my opinion however, the probability of high stock market returns going forward is substantially lower than it was at the previous trough of this indicator at the end of 2008. I will aim to publish this indicator monthly going forward so stay put. Lessons Worth Remembering: Who Predicted the Bubble? Who Predicted the Crash?